This article explores the implications of the relationship between the twin deficits in the context of the current situation for the United States, which may or may not be on the edge of a significant economic retrenchment. It looks at the detail of how trade tariffs act on the economy at the current stage of its credit cycle and the implications for the economic outlook and for monetary policy. It examines the problem through the lens of sound economic theory, but empirical evidence is invoked as well for confirmation. Another factor affecting America was the collapse of agricultural prices from inflated wartime levels. By 1921, wheat had collapsed from $2.58 a bushel to 92 cents and hogs from 19 cents per pound to under 7 cents. Tariffs did not help farmers, because at that time, they depended on export markets to a significant degree. And when other countries introduced or increased their tariffs against agricultural products as a response to US tariffs, they proved to be wholly counterproductive for US farmers. Of course, tariffs were not the sole problem for America’s farmers. Rapid mechanisation increased Canada’s wheat yields, the Argentine was increasing beef production and Cuba exporting large quantities of sugar. Consumers were benefiting from catastrophically lower prices despite tariffs. Other than the pain faced by producers, pain which in free markets is only alleviated by redeploying economic resources away from overcapacity in agriculture, the overall economic effect of the Fordney-McCumber tariffs on America was not significant. Smoot-Hawley was different. Congress voted in favour of it on 31 October 1929, and the stockmarket clearly saw it coming. The Wall Street Crash commenced on Black Thursday, 24 October, when the market fell 11% that day, before recovering most of the fall. Black Monday followed, when the market fell 13%. By the close on Tuesday 29 October the market had lost over 34% in just fifteen calendar days. At today’s stock prices, that would be a loss of over 8,000 Dow points. The stockmarket continued its fall to a low on 13 November of 198.7 on the Dow, and after rallying for six months entered a pernicious and continual bear market to a final low of 41.22 on 8 July 1932. It is always a mistake to attribute a market failure to a single cause: the only certainty was the market fell. However, the importance of the Smoot-Hawley vote to the stockmarket is often missed by economic historians. The difference between late-1929 and today perhaps, is that Congress voting for it then was a definite event, whereas Trump’s tariffs are progressing as a fluid mixture of bluff and fact. Another key difference was the dollar’s gold exchange standard of $20.67 to the ounce. So long as the exchange rate was defended, a slump would certainly lead more dramatically to widespread bankruptcies. Markets therefore had to discount the enhanced risks from trade protectionism to the economy more immediately compared with today’s fiat currency economy, when it is assumed future investment risk will be ameliorated by monetary expansion. Pursuing this line of thought is unlikely to lead us to a definite conclusion. A more fruitful approach is to look at the effect of tariffs and trade protectionism in the context of the credit cycle. We have established from our examination of the 1921 Fordney-McCumber tariffs that early in the credit cycle trade protectionism had a limited impact on financial markets and the economy. It stands to reason that an economy floating on a tide of money and credit is in a different position, and more vulnerable to disruption from upsetting events such as the introduction of tariffs. Adverse changes in trade policy at any time are an upset to market assumptions, and it is clear from both Smoot-Hawley and common sense that Trump’s trade interventions today are a serious spanner in the works of highly valued markets. That is tantamount at the minimum to a claim that Trump has upset the speculators. This is evidently the case, but to understand why Trump’s trade protectionism should be taken more seriously, we need to examine in greater detail the flows implied in the equation at the beginning of this article linking the two deficits. Since the oil shocks of the early 1970s, the US has relied on foreign holders of dollars to accumulate US Treasuries issued to finance budget deficits. That recycling of dollars earned by foreigners selling more things to America than America buys from foreigners has through trade imbalances allowed the US Government to run mounting budget deficits. The Americans have become used to foreigners having no credible alternative to reinvesting their accumulating dollars. However, we can now see that the dollar hegemony behind this proposition is being eroded by China and Russia, acting as the powers which are increasingly directing Asian trade flows. Clearly, as their determination to do away with dollars bears fruit, instead of currently held dollars remaining invested they will be surplus to trade requirements and sold. So far, they have been bought by other foreigners, which is why we see China’s holdings of US Treasuries decline, while those of other foreigners increase, and why Russia’s disposal of cash dollars earned through energy sales has little apparent effect on the exchanges. Meanwhile, the US Government has managed to fund itself without a critical increase in borrowing costs. This cannot continue ad infinitum, because relative to the volumes of trade concerned and the size of the US economy, there are already large quantities of dollar balances and dollar investments accumulated in foreign hands, which on the last available figures at over $22tn exceed US GDP of around $20tn. The failure of American trade policy is to not recognise the consequences of upsetting what has become a very delicate balance in capital flows. By imposing aggressively protectionist policies, the Trump presidency has set back cross-border trade significantly, reducing the future availability of dollars from non-domestic sources to fund the budget deficit. Furthermore, US efforts to restrict inward commercial investment by China muddy these waters further. On these grounds alone, we can see that attempts to restrict Chinese imports are cutting off a vital source of future finance for the US Government. Yet, the accounting identity that explains the twin deficit phenomenon tells us in the absence of an increase in the savings rate the trade deficit will continue. Furthermore, due to tax cuts the budget deficit is still increasing at this late stage of the credit cycle, and an emerging slowdown in the rate of GDP growth tells us it will increase even more rapidly than currently forecast. Therefore, American protectionist policies risk destabilising the market for US Treasuries, which have increasingly relied on foreign buyers recycling their surplus dollars. The question then arises as to what happens if a contraction in international trade develops out of the current slowdown. The dollar is likely to face a developing problem. It is already becoming evident that surplus dollars arising from the slowdown in international trade are shifting out of the dollar into other currencies and gold. 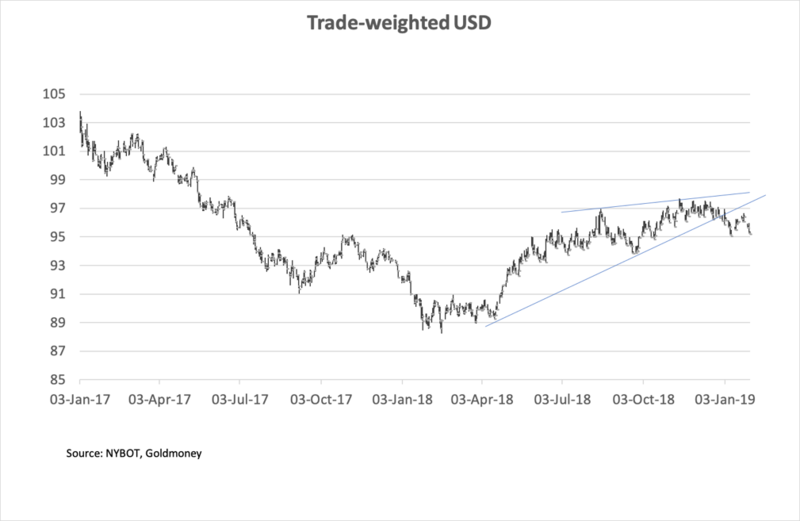 The following chart of the dollar’s trade weighted index illustrates the position. The dollar’s bear market appears to be resuming after completing an eight-month counter-trend consolidation. Given record levels of foreign ownership of dollars and dollar investments, further declines in the dollar could easily trigger currency liquidation, making it impossible for the US Government to continue to fund budget deficits from foreign investors. It appears this is a periodic problem, first encountered when the dollar devalued in 1934, and then in the 1960s when the gold pool failed. This time, with the dollar being unbacked by gold, there is little to stop the dollar’s exchange rate falling as cross-border capital is repatriated to their currencies of origin or into gold. A secondary effect of today’s trade policies has been to interrupt the Fed’s monetary normalisation, leading to what the Fed hopes is just a temporary pause in the process. This assumes the banks are not going to become more risk-averse and is where a contraction in international trade could disrupt the expansion of bank credit, upon which financial markets in particular have become so reliant. How this might occur is an important question that should be addressed. To understand the mechanisms of how changes in the trade balance can affect the level of bank credit, we must first explain why in the absence of a change in savings, a budget imbalance leads to a similar trade imbalance. Let us assume a government is running a budget deficit. The deficit represents excess spending over tax and other incidental income and requires to be financed. If the government issues bonds, the extent to which they are subscribed to by members of the public, their pension funds and insurance policies, is not inflationary financing, merely diverting capital resources from other investments. If the government issues bonds that are subscribed to by banks, then they are financed through the expansion of bank credit, and unless that credit is withdrawn from other bank customers, it is inflationary. Lastly, the deficit may be financed by the central bank, directly or indirectly buying government bonds and bills. This is also inflationary. As the government spends the proceeds of these bond issues, to the extent they are not financed by private sector savings they put extra currency into circulation. This extra currency ends up mostly in the hands of consumers through welfare payments, as well as earnings and payments by the government for goods and services. But given there is a degree of inelasticity between the supply of extra goods and services and the inflation-fuelled demand for them, it takes time for markets to respond to the inflationary demand. Consequently, imported goods and services rise to fill in the gap, the more so because they are unaffected, at least initially, by price pressures arising from the monetary inflation. In effect, it is the expansion of money and credit that emanates from covering a budget deficit, assuming no change in total savings, that leads to a trade deficit. What happens to the exchange rate depends on whether the currency proceeds arising from imports are reinvested or simply sold on the foreign exchanges. Balance of payments figures are designed to capture the net position between trade and capital flows, and it is these figures that are used in the deficit relationship. All this assumes a reasonable degree of economic stability. That is to say, trade continues without severe disruption. It is not the case at the end of a long credit cycle, when capital misallocation in the private sector has become so great that sooner or later market forces emerge to trigger a correction. It is at that point obstacles to balance of payment flows are likely to have the greatest impact, setting off and intensifying an unwinding of the accumulated distortions in the domestic economy. This was the reason the events following the passing of Smoot-Hawley were so different from those following Fordney-McCumber. The approval of key provisions in Smoot-Hawley by Congress in October 1929 crashed Wall Street in the preceding fortnight, and when President Hoover signed it into law the following June, not only did Wall Street continue to fall for a further two years, but retaliatory action from other nations ensured the ensuing global economic disaster worsened and America’s exports in turn suffered badly. We are at the same point in the credit cycle, which has run for a similar time as that of the 1920s, and we have an analogous rise in American protectionism. Complacency is common to both. Irving Fisher, the renowned American economist, reflected the super-optimism before the crash of 1929 when he stated the stock market had reached a permanently high plateau. Even Keynes and Winston Churchill were taken in and lost money. They were far from being alone, and the prospect of a substantial fall in stocks today is widely assumed to be unjustified scaremongering. When he was wiser after the event, Fisher went on to define the vicious relationship between falling collateral values and contracting bank credit. Insofar as today’s economists claim it was the cause of the depression’s severity, they are incorrect. The cause was the monetary and speculative excesses that had built up before the crash. If anything, the imbalances and misallocation of capital today should be a far greater concern than they were in 1929. We know that a feature of the post-Smoot-Hawley events was the unwinding of malinvestments, and the severe contraction of outstanding bank credit that accompanied it. Thousands of banks went under. A repeat of these events today is wholly unexpected, with even the bears thinking the economy can be rescued by just lowering interest rates and reverting to quantitative easing. However, a proper and thorough examination of the risks today reveals that a slowdown triggered by trade protectionism will be almost impossible to prevent escalating into a full-blown slump. The central question in any analysis of future economic and monetary prospects has to be what will happen to the twin deficits. We know as surely as the sun will rise tomorrow and every day thereafter that as an economy moves from a stockmarket fall towards a slump, budget deficits will rise inexorably, particularly in the welfare states. Yet, with demand collapsing in the private sector, trade deficits cannot increase in lock-step with budget deficits. The only way the national accounts can be balanced in a fiat-money economy is for there to be an offsetting contraction in bank obligations to the private sector. A contraction of bank credit in this event will be impossible to stop, and it matters not how well capitalised a bank is for regulatory purposes. Fractional reserve gearing will ensure that widespread bank insolvencies and bankruptcies ensue. It seems increasingly likely that spurred on by falling stockmarkets and dollar weakness, a foreign liquidation of an overhang of dollar cash and assets will follow. If so, the dollar will fall and in accordance with Irving Fisher’s analysis, a self-feeding implosion of private sector bank lending will then take place. Whether other currencies fall with the dollar is immaterial: the fall will be measured in its purchasing power and credibility measured in gold. The difference from the experience of the events that led into the Great Depression is today’s money is not backed by gold. Inflationists believe that the problems of the 1930s could have been solved if the gold standard had been abandoned, or if excess gold reserves had been monetised. They argue that similar conditions today can be avoided by allowing the currency to weaken, and therefore to prevent prices from sliding. Monetary policy today is and surely will continue to be guided by these inflationist assumptions. Central banks, led by the Fed, the ECB, Bank of Japan and Bank of England will coordinate aggressive money expansion in a vain attempt to prevent a slump developing. And while the quantity of outstanding bank credit contracts, it will be more than made up for by the expansion of central bank money. Today’s central bankers are unquestionably on the same course set by Rudolf Havenstein, president of the Reichsbank during Germany’s hyperinflation of 1920-23. Havenstein was imbued in a system that financed itself predominantly through money-printing. Today’s central bankers are not much different, believing that inflation of the money quantity must be a continuing, and if necessary accelerating process. Pre-Keynesian economic theory, refined by the Austrian school, identified the credit cycle as the primary cause of periodic booms and busts. To this we can add a sporadic cycle of trade protectionism, which at the wrong moment can have a devastating effect. While it is impossible to satisfactorily link cause and effect, there is little doubt that it was the combination of Smoot-Hawley tariffs and the end of an inflation-fuelled boom that devasted the world economy in the 1930s. This article has shown that similar conditions exist today. We must hope that they don’t repeat, but it would be foolish to ignore the possibility. The obvious difference is currencies are now unbacked, giving governments an initial policy choice. They can let commercial banks go bust, as happened in large numbers in the 1930s and cut government spending to preserve a degree of currency stability. Or they can trash their currencies in an attempt to protect jobs and the state. We can be sure in advance the course that will be taken.